Sony Classical will celebrate the New York Philharmonic’s 175th anniversary season with New York Philharmonic — 175th Anniversary Edition, a 65-CD compilation of the Orchestra’s recordings from 1917 to 1995, to be released on April 7, 2017. 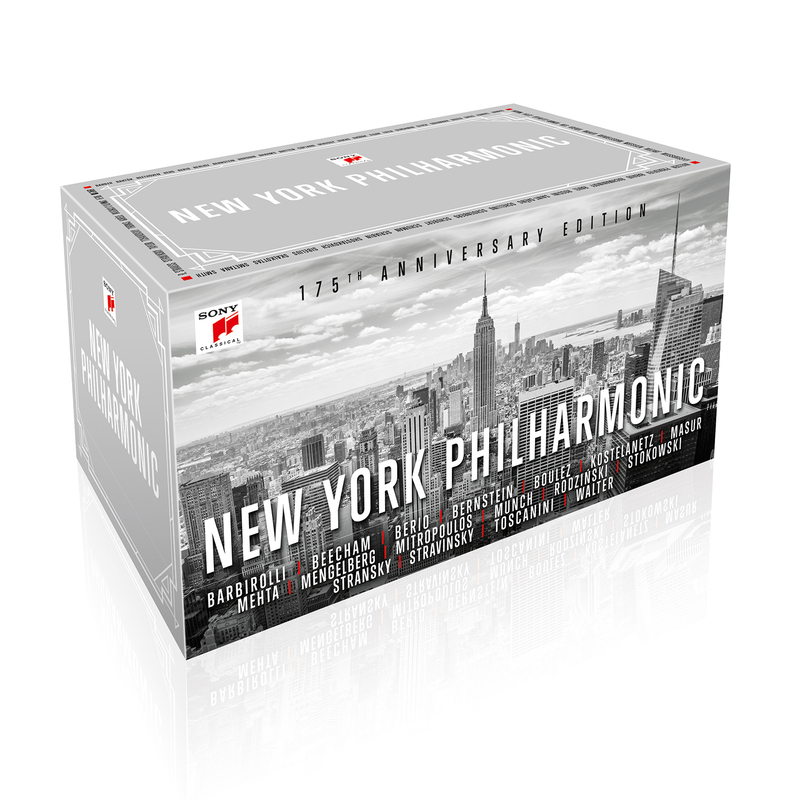 New York Philharmonic — 175th Anniversary Edition was produced by Sony Classical and curated by James H. North and Michael H. Gray with Philharmonic Archivist / Historian Barbara Haws. Thirty-five of the recordings have been remastered from the original discs and tapes for this edition, of which 20 are being released on CD for the first time and 15 are appearing for the first time on Sony-authorized CDs in the U.S. Deems Taylor’s Through the Looking Glass, conducted by André Kostelanetz and recorded in 1975, is being released for the first time in any format. 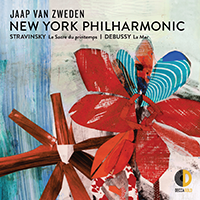 The compilation centers on symphonic works led by Philharmonic Music Directors — John Barbirolli, Leonard Bernstein, Pierre Boulez, Kurt Masur, Zubin Mehta, Willem Mengelberg, Dimitri Mitropoulos, Artur Rodziński, Leopold Stokowski, Josef Stransky, Arturo Toscanini, and Bruno Walter — and will also feature performances led by distinguished guests, including Thomas Beecham, Luciano Berio, André Kostelanetz, Charles Munch, and Igor Stravinsky. Twenty-five of the discs feature Laureate Conductor Leonard Bernstein (Music Director, 1958–69) leading works by composers including Barber, Beethoven, Copland, Gershwin, Harris, Ives, Mahler, Nielsen, Ravel, and Stravinsky, as well as his own works. Click here for a complete list of the set’s contents. Click here for an image of the box set. Also included is a 160-page hardcover book with an introduction by Philharmonic Archivist / Historian Barbara Haws titled “The New York Philharmonic: A Musician’s Orchestra for 175 Years.” The 65-CD box set with hardcover book is available for pre-order here. It was released in Germany, Switzerland, and Austria on March 17, 2017, to coincide with the Philharmonic’s EUROPE / SPRING 2017 tour and with the Vienna opening of Vienna and New York: 175 Years of Two Philharmonics, a joint exhibit of archival material drawn from both orchestras’ histories, and will be released worldwide on April 7, 2017. Since 1917 the New York Philharmonic has made more than 2,000 recordings, with more than 500 currently available. Since 1961 the Philharmonic’s recordings have been awarded 22 Grammy Awards, and in 2003 it made history as the first symphony orchestra ever to make a solo appearance on the Grammy awards, one of the most-watched television events worldwide. In 2004 the Philharmonic was the first major American orchestra to offer downloadable concerts, recorded live. Following on this innovation, in 2009 the Orchestra announced the first-ever subscription download series: Alan Gilbert: The Inaugural Season, available exclusively on iTunes, produced and distributed by the New York Philharmonic, and comprising more than 50 works performed during the 2009–10 season. The Philharmonic’s self-produced digital recording series continues with Alan Gilbert and the New York Philharmonic: 2016–17 Season. Sony Music Masterworks comprises Masterworks, Sony Classical, OKeh, Portrait, Masterworks Broadway, and Flying Buddha imprints. For email updates and information please visit sonymusicmasterworks.com. Programs are supported, in part, by public funds from the New York City Department of Cultural Affairs in partnership with the City Council, the National Endowment for the Arts, and the New York State Council on the Arts, with the support of Governor Andrew Cuomo and the New York State Legislature.